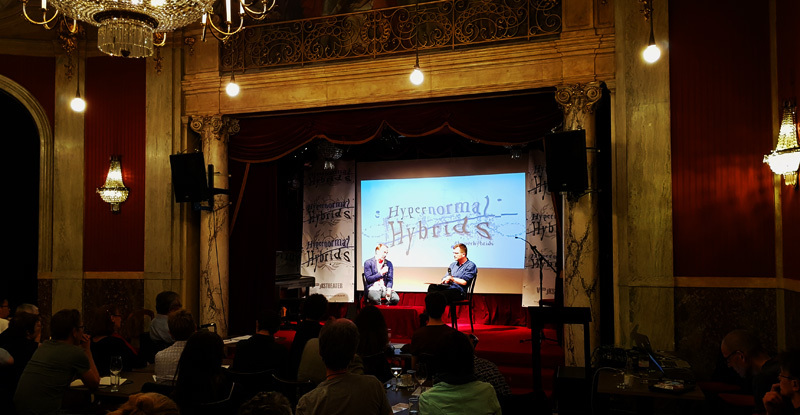 As the Hypernormal Hybrid series continues, this evening aims to explore a peculiar and intriguing topic of our algorithmic world: the Unconscious. While the neoclassical interior of Volkstheater’s Rote Bar is merging with the algorithmic sound performance of burn_those_idle_cycles, visitors are enjoying their first drinks. The evening starts when Anna Badora from the Volkstheater welcomes the audience. As soon as Konrad Becker takes over the microphone, burn_those_idle_cycles starts to play its algorithmic tunes again. While artificial and natural sounds are mixing, Becker asks several crucial questions concerning the new architecture of communication that is emerging in our world, in our cities, in our dreams. What is the influence of this new architecture of communication? What is the role of the “fictional” narratives and models that we are producing? What new cultural and social realities are emerging in this interconnected world? All of those questions aim at exposing the influence of new technological networks that permeate our urban living spaces, thereby shaping our perception and actions. Tonight, those questions are directed towards the role of the Unconscious: an evening about cybernetic dreams and fictional scenarios. As Lydia Liu approaches the podium, the algorithmic sounds fade away. She introduces the notion of the Ultimate Machine, as it was developed by Marvin Minsky: a machine that switches itself off, symbolizing the fascinating idea of machinic death and showcasing the narcissistic loop of human-machine simulacra. Many of us talk about cyborgs, androids, and posthumans; we either love or hate them while they dominate our dreams and social lives. Robots are being built to resemble humans while humans are starting to behave like robots: the Uncanny Valley is becoming a two-way street, as Liu’s concept of the “Freudian Robot” suggests. Drawing upon Sigmund Freud’s 1919 essay “The Uncanny” (Das Unheimliche), Liu explains that the source of the Uncanny lies in something that is familiar and old-established in the mind, but has become alienated through the process of repression. The question today is if the automata and works of artificial intelligence invoke the same feelings of the Uncanny: do they bring something to light, which ought to have remained hidden? The very same question can be asked about Masahiro Mori’s famous concept of the Uncanny Valley (1970). Mori has argued that as robots become increasingly humanlike, our human feeling of empathy and familiarity rises until we reach an Uncanny Valley. Marvin Minsky’s notion of the Emotion Machine is also interesting here: an intelligent robot, that is equipped with mental sensors and suppressors, adding the feature of machinic emotion. Only by adding a cognitive unconscious that consists of Frames, Terminals, Network Systems, but also of Bugs and Suppressors, the robot-AI’s can really become intelligent. What Liu misses in Minsky’s work however is the acknowledgment of Freud’s element of death(-drive). Even though, the Emotion Machine might escape the Uncanny Valley, the narcissistic loop of the human-machine simulacra is still present as we aim to make a version of ourselves that has conquered death. In response to Liu, Thomas Macho starts off with the notion of the Ultimate Machine, since the questions that this machine raises are becoming very relevant in our times of technological acceleration: do we already have suicidal machines that turn themselves off in such a rapid manner that we cannot even react upon them? The 2010 Flash Crash could be a good example of such machinic suicide. Large stock indexes inexplicably losing billions of dollars in within a few minutes, but recovering very soon as well: A digital invisible hand seemed to be pulling the strings. Another interesting example is Jean Tinguely’s Homage to New York (1960). Tinguely assembled a giant art-installation from pieces of scrap and designed it to be a self-constructing and self-destroying machine. Quoting the words of Marcel Duchamp: “If the saw saws the saw/ And if the saw sawing the saw/ Is the saw sawed by the saw/ What results is metallic Swiss-icide”, Macho asks the question: Why? Why are we trying to design machines that are not immortal? Liu thinks it is our fascination with this elegant simplicity of the machine turning itself off: the cybernetic idea of an Ultimate Machine exposes our relationship to technology. Next to that, Macho draws attention to the psychoanalytic school of Melanie Klein. From that school, the transitional object is an interesting concept for this evening. As Donald Winnicott developed it (1953), this object functions as an intermediate between the psychic and external reality in infants. Those transitional objects are so interesting because they belong to the child itself, while at the same time they constitute the awareness of the separation between the child itself and the object. Transitional objects are both us, as well as the Other: they are the perfect example of the Uncanny. In the same way that the teddy bear is a transitional object to the child, our technological devices (e.g. smartphones) are transitional objects to us. That is where the Uncanny Valley develops itself. Liu elaborates on this idea, explaining that the analytical insight into the distinction between oneself and the object isn’t that clear, which is a very useful way to think about the Uncanny. Finally, Macho draws the discussion towards the immortality that capitalism tries to promise us. A promise that is made while the entire system is actually based on destruction of what is there, as it was for instance theorized by Schumpeter in his concept of “creative destruction”. This is according to Liu exactly what is at stake: the capitalist machine runs on destruction, which is the way in which profits are made. However, as Lacan said, the machine will run, until it is jammed and destroys itself. As long as it does not destroy itself, it is almost like the unconscious: it just runs. This is exactly why the Ultimate Machine is the capitalist machine: the denial of death is built into it, but at the very same time it destroys itself. When science-thriller author Marc Elsberg and Felix Stalder (World-Information Institute) enter the podium, the issue of imagination becomes the central element of discussion. The question is here: what does the relationship between fiction and reality entail? More specifically: what is it that novels render graspable, which cannot be done in other forms of writing? Something that, according to Elsberg, has to be found in the emotional layer that fictional stories draw upon. This makes the novels also interesting when it comes to the development of scenarios. Whereas policy-makers and planners can develop many scenarios, the novel-writer can only write one book. The idea of having an audience that develops an emotional engagement with the narrative is therefore never far away for a fiction writer. Another interesting phenomenon when it comes to fiction and its audience, is the question regarding the imaginative power of the fictional narrative. Stanley Kubrick’s 2001: Space Odyssey and its depiction of HAL 9000 offer a good example, as does William Gibson’s concept of “cyberspace”. When does fiction achieve such a status? This is mainly dependent on the ways in which narratives can be interpreted, as well as on the imaginative appeal of the story’s techno-futurist vision. This is exactly the reason why many science-fiction writers are so eager to stay informed of the latest developments in their field, like Arthur C. Clarke who went to see Claude Shannon in Bell Labs and encountered a real version of the Ultimate Machine. Elsberg himself has always been very engaged with emerging technologies. Moreover, he meets regularly with experts from academic fields such as anthropology, informatics, and sociology. The art there is to boil the matter down to an essential theme that can drive the narrative, thereby translating complexity into something that appeals to the reader’s reading experience. This interplay between complex explanations, fiction, and a world full of contingencies is generally very fascinating. Drawing patterns and models is something that intrigues many of us and it can be done in all kinds of different ways: from algorithmic necessities to narrative plots to conspiracy theories. Science-fiction writing has an interesting position here since it allows for the development of narratives that can explore this symbiotic relationship between necessity and contingency through playful and powerful imaginations. As the Hypernormal Hybrid series continues, the border between cybernetic reality and the machinic unconscious, the division of algorithmic patterns and fictional scenarios, is blurring more and more.